FREE upgrade to Priority Mail shipping – 2 to 3 Day delivery – on these gifts. Please order by 12/19 for Christmas delivery. A gift announcement card will be sent on late orders. We will continue to ship for the holidays to most areas of the country until 12/21 – it’s just not guaranteed to arrive by Christmas if you order after 12/19. Sorry! Priority Mail Gifts can not shipped to Arizona, California, Louisiana or Texas. Just in time for the holidays, our grove-fresh, sweet, juicy Navel Oranges wrapped up pretty in our signature paper, plus two handy Fruit Spoons, Chocolate-Dipped Coconut Patties, and a jar of our must have Orange Marmalade. A gourmet treat guaranteed to arrive in perfect condition. 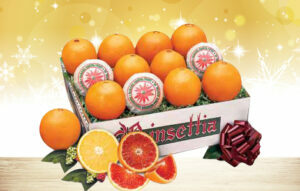 With Free Priority Mail Upgrade, we’ll get these delicious Navel Oranges and Red Navel Oranges home for the holidays. 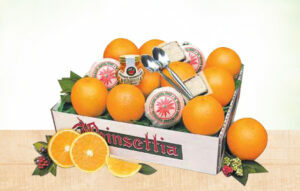 Both varieties are sweet and easy to peel. and sure to give the holidays a festive twist. Available December only! This classic combo is holiday ready. Elegantly wrapped in tissue paper, Navel Oranges and Ruby Red Grapefruit arrive along with foil wrapped Chocolates and a festive Bow! We’ll include a Free Priority Mail Upgrade, so this gift gets to its destination in a flash.